The EU is a doomsday machine generating deflation, low growth, and high unemployment – and a rising tide of far right nationalism. Is “Remain and Reform” a realistic strategy for the UK left? As is to be expected with any organisation or set of institutions of such scope and scale, the European Union is not singular – it is not just one thing. Being large, the EU contains multitudes. It should be perfectly possible to point to EU accomplishments in the areas of rights and regulation without losing sight of the fact that at its core the EU contains a clear hierarchy of priorities. At the top of this hierarchy, trumping all notions of a “Social Europe” or policies and funds aimed at solidarity and development, is a particular version of economics. This can be traced back to the EU’s beginnings in the original coal and steel pact but was really crystalised in the single market that came into force in 1987 through the Single European Act. Since then there has been a steady evolution of European law beyond one based on procedures to one that embodies substantive ideological content. A version of economics – call it neoliberalism – is now written in constitutional stone in the EU treaties. As the case law shows, Article 345 of the Treaty on the Functioning of the European Union (TFEU) (2008), carried over from the 1957 EC Treaty and commonly held up by the pro-EU left as protecting political indeterminacy regarding property ownership (thereby safeguarding publicly owned industries), has been effectively sidelined. In the matter of shielding public services from competition law, the power to interpret Article 106 TFEU, which pertains to both “public undertakings and undertakings to which Member States grant special or exclusive rights” and to “undertakings entrusted with the operations of services of general economic interest or having the character of a revenue-producing monopoly”, has enabled the European Court of Justice to encourage private companies to “undermine, if not destroy, state reservations of exclusivity”. (2) Member States seeking to secure exemptions on public interest grounds are held to a very exacting standard. Public procurement and state aid face similar prohibitions, given the privileged position EU law affords to market forces and private enterprise. There is therefore a substantial jurisprudence behind the claims of the Eurosceptic left that the EU makes socialism – and many aspects of social democracy – effectively illegal. Democratic choice has been replaced by a pre-determined economic settlement the norms of which now carry the weight – in the UK every bit as much as in the other 27 Member States – of constitutional law. 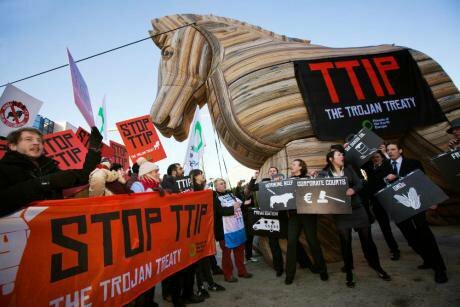 The Transatlantic Trade and Investment Partnership (TTIP), if enacted, would only deepen this problem. Meanwhile, the economic consequences across the continent of the EU’s neoliberal turn are increasingly plain for all to see. When there is growth there will be a few crumbs for social welfare; when there is not – as is the case today – there will be austerity. Moreover, in the wake of the financial crisis it has become clear that a deflationary doomsday machine now sits at the heart of the EU in the form of an unbalanced monetary union that is generating unending recession, low growth, and high unemployment – a recipe for stagnation, social disintegration, and political backlash. Accompanying the liquidity support and emergency loans that formed the Eurozone’s belated response to the crisis has been a brutal austerity regime, imposed at first on the periphery – the so-called PIGS countries of Portugal, Ireland, Greece, and Spain – but now increasingly felt in core countries as well (3). This is clearly the case in France, currently beset by massive unrest in the face of the government’s attempts to ram through structural reforms containing savage attacks on workers’ rights under the veil of an extended state of emergency. Such utterly wrongheaded economics carries with it a grim attendant politics of resentment and scapegoating that is giving rise to a tide of far right nationalism in Europe across countries as diverse as Hungary, the Netherlands, Austria, and France. With its constitutionalised neoliberalism and German-led deflationary policy, the EU itself is now a vast engine for reproducing precisely those dangerous political currents and forces that EU enthusiasts claim it is designed to prevent. Stuck as we are in a burning building, it is little wonder that there are increasingly determined calls for a move to the exits. Confronted with the neoliberal character of the EU and its deepening unpopularity among voters, sections of the British left have recognized the need to break with the status quo and yet persist in refusing a Brexit on what – a self-fulfilling prophecy! – they characterise as Tory terms. For these seekers of a new middle way, the mantra has become “Remain and Reform”, or – more inspiringly – “Another Europe is Possible”. This is undoubtedly the case; many things are possible, and the left should certainly not be in the business of foreshortening political horizons – especially in an era of instability, flux, and change like the present. The question is therefore what such a “Remain and Reform” strategy would actually entail, and the probability of being able to achieve it. The first thing to say is that the level of reform being envisioned by the “Remain and Reform” crowd is quite radical – necessarily so. It encompasses the democratisation of the institutions and decision-making procedures of the EU as well as the alteration of the substantive content of current economic law. In other words, to “Remain and Reform” will require EU treaty revision. The provisions for changes to the EU treaties are clear and are spelled out in Article 48 of the Treaty on European Union (TEU). Under the “ordinary procedure” concerning key amendments, “such as increasing or reducing the competences of the EU”, national governments (or the European Parliament or European Commission) can submit a proposed treaty revision to the Council of the European Union. Then, if the Council “adopts a positive decision,” a convention will be called (comprised of representatives from national parliaments, national governments, the European Parliament, and the European Commission). This convention discusses the proposed revision and makes a decision by consensus, following which a conference of representatives of the governments is convened “with a view to adopting by common accord the amendments to the treaties”. And, of course, revisions cannot come into force until they are ratified by all EU Member States. Under the “simplified procedure” established by the Treaty of Lisbon, revisions concerning internal EU polices and actions can be made without the need for a convention or intergovernmental conference. The European Council consults the European Commission, the European Parliament, and – if the revision is related to monetary issues – the European Central Bank, and then makes a decision on the basis of unanimity. Once again, the revisions need to be ratified by all EU Member States. This is an onerous but not impossible process. “The history of the EU”, as political scientist Carlos Closa wrote in a 2014 analysis, “shows that treaty revision is almost essential to its existence”. (4) Treaties were, of course, adopted or amended in 1967 (Merger Treaty), 1987 (Single European Act), 1993 (Treaty on European Union), 1999 (Treaty of Amsterdam), 2003 (Treaty of Nice), and 2009 (Treaty of Lisbon) – as well as upon the accession of new Member States in 1973, 1981, 1986, 1995, 2004, 2007, and 2013. The recent Lisbon Treaty amended previous EU treaties and included, among other things such as the Charter of Fundamental Rights, changes to rule-making procedures, extending the European Parliament’s co-decision-making powers to most EU legislation (and renamed the “ordinary legislative procedure”), allowing the European Parliament to elect the President of the European Commission, giving national parliaments the power to monitor and challenge infringements on subsidiarity, and allowing the European Parliament to propose treaty amendments. On substantive content, just because the progress of the EU has been mostly unidirectional thus far – a one-way ratchet of deeper integration, liberalisation, and marketisation – doesn’t mean that it isn’t theoretically possible for this to be reversed or redirected. The European treaties are what matters, and the treaties can be changed. (5) The overarching question is therefore one of likelihood, of political judgment as to whether it is possible to deliver the pan-European coalition necessary for a transformation opposite from and antithetical to the direction of travel of the EU for much of its history – at the very least since the creation of the single market. Bringing about such changes would, at a minimum (using the simplified procedure), require building a political coalition that encompasses the entire European Council (the Council of Ministers of the Member States) and enough support in the European Parliament, the European Commission, and – if monetary matters are involved – the European Central Bank for those institutions not to advise and agitate against the changes. Although daunting, such lopsided political dominance of the EU has in fact been achieved in the past by the parties of the centre left. At the turn of the twenty-first century, social democratic or centre left governments held office simultaneously in 12 of the then 15 Member States of the EU. (6) Of course, these governments were avatars of the “Third Way” – the widespread compromise made possible by a particular historical conjuncture, now passed, in which centre left parties became non-threatening to the interests of capital, promising only to skim the surplus created by economic growth for ameliorative social spending. By contrast, the governments that would have to be elected in order to bring about major structural reform of the EU would need to be much more radical, and would thus face far greater political headwinds than did Blair, Jospin, and Schröder. (Substantial EU enlargement has also fundamentally altered the political calculus and significantly increased the difficulties.) Left governments would also have to be in office all at once – an enormous coordination problem across 28 Member States given varying national election cycles. However, leaving all these difficulties to one side and suspending disbelief for the moment, it is worth looking at the current state of play politically in the Member States of the European Union to gain a sense of how close or distant such a possibility might be. The following table provides a rough sense of the political balance of forces in the EU today. Based on an analysis of recent election results, it shows the approximate percentage of seats held in national parliamentary bodies (upper and lower houses) by the radical left, the centre left, the centre, the traditional conservative right, and the far right. This table is meant to be broadly illustrative. We have endeavoured to include the most recent data available, but we have also made a number of methodological assumptions and choices – independents and appointed officials, for example, have not been included – and we have made evaluative judgments as to appropriate identification of parties along the political spectrum. The result is intended purely as a rough snapshot of the general political balance of forces across the Member States of the European Union at the national level. What we can see immediately is that more than a third of EU Member States (11 out of 28) have no radical left-wing parties to speak of, and in another 6 they have 6 per cent or less of seats in a parliamentary body. In many cases, majorities would require – at a very minimum – an alliance between the radical left and a newly radicalised centre left around an agenda of fundamental economic reform at the national and European level. This is no mean feat, given the often acrimonious history of sectarian and policy differences on the left. Not only would the hatchet have to be buried domestically, but some major shifts in attitudes towards the EU would need to occur. The radical left would have to relinquish what are in some cases very long-standing anti-EU positions while the centre left would have to shake off complacency towards the actually existing EU and become radicalised along Corbynist lines. Notably, the role of the centre left would be critical to any “Remain and Reform” strategy. In Germany, for example, on present strength the SPD would have to give up its aversion to any national electoral pact with Die Linke (there are some precedents for cooperation at the level of the Lander) to scrape even the slimmest of majorities. Some centre left parties are barely progressive at all, and would be more stubbornly neoliberal and resistant to left-wing populist pressure than others. In all or almost all cases the latter pressures would have to prove triumphant. In extreme cases like Poland, there is currently no significant left of any kind on which to build. Once again, we should not rule out such changes as totally impossible – as the example of Greece famously attests. Between 2009 and 2015 the vote for the two main Greek parties of the centre left and centre right, PASOK and New Democracy, collapsed by fully 58 per cent (with most of this coming from the near total destruction of PASOK), with upstart Syriza surging from 4.6 per cent to 36.3 per cent. However, such a complete transformation of a national party system came about under extreme conditions, with unemployment reaching in excess of 25 per cent (more than 50 per cent among the young) and one of the greatest peacetime contractions of any major economy in the history of capitalism. Even were all this to go the right way, EU treaty revision would also require that such political transformations occur concurrently, and that there be broad general agreement among left parties and alliances as to the direction, form, and extent of change. We should not press the latter point too much – the EU, of course, faces this problem all the time and has developed mechanisms and processes for such negotiation. That said, we should probably also factor in either passive or even active resistance from the EU bureaucracy, which contains many convinced neoliberals, and acknowledge that such a complete overhaul of the EU would cause capital markets to go berserk, producing economic crises at both the Member State and EU-wide level. On the evidence above, it is fair to say that any “Remain and Reform” strategy faces a very heavy lift indeed if it is to deliver the dramatically transformed EU that its proponents envision. To think that this is achievable or could become so any time soon probably requires a certain amount of magical thinking – believing, with J.M. Barrie's Peter Pan, that anything is possible if only you wish hard enough. Given the steep climb to any possibility of “Another Europe,” the opportunity represented by Brexit begins to appear in a very different light. A convergence of right and left now has the very real prospect of taking the UK out of the EU – of exiting the burning building. While this inevitably involves voting (although not campaigning) together with some very vile and unpleasant bedfellows, we might look to Marx for a reminder that we on the left do not in fact get to make our history just as we please, under circumstances precisely of our own choosing. It’s unrealistic to stipulate that a Brexit decision should only be made under the most politically pristine conditions. We can unconditionally reject the racism, xenophobia, and nationalism of the right while still recognizing the opportunity of Brexit. The arguments of this referendum campaign have for the most part been extremely inward looking. There has been a lot of sneering at Lexit, but it’s the liberal-left urging Remain who are the true parochials, fixated on short-term fears of Johnson or Gove when the bigger picture is the dangers posed by a continent groaning under the weight of stagnation and austerity. In their attachment to the EU they mistake the epiphenomena of European cooperation – nice notions of holding hands across borders, of city breaks and Erasmus scholarships and cultural interchange – for the underlying structural operations of the EU as an economic regime. A similar error occurred in the previous, Victorian era of globalisation, when onlookers were transfixed by the fruits of liberal internationalism – the proliferation of multinational agreements, the laying of trans-oceanic underwater cables, the synchronisation of clocks, and the standardisation of weights and measures – and missed the attendant horrors of colonialism and imperialism and the deep conflicts that were brewing and were to erupt in the charnel house of the first half of the twentieth century. Following Frankie Boyle, the British left should be looking at the EU with growing alarm and trying “to get one arm out of this straightjacket before the shooting starts”. There are also tactical and strategic benefits to exiting the EU in advance of a future left government taking office in Britain. Such a left government would have quite enough trouble on its hands already without the added difficulty of hand-to-hand combat with the EU or a negotiated exit. Capital markets will likely be kinder to a Tory Brexit than they would to any conceivable future Lexit, and the Conservatives can be allowed to take the hit for the inevitable economic disruption that follows. It is also possible that a Tory-led Brexit – and the subsequent political fallout – could open a new path for the election of a Corbyn-led government. Our international contribution, as the British left, would then be to attempt what Greece, bound hand and foot by the Troika, has been decisively unable to pull off – a rupture with the present neoliberal settlement in favour of a serious effort to develop a different model in categorical refutation of the claim that “There Is No Alternative”. This will be extremely difficult to accomplish. But it is far more readily achievable than a pan-European political project to democratise the European Union from within. And above all else an actually existing alternative model is precisely what the guardians of the status quo – in the EU and elsewhere – fear the most. It is for this reason that Syriza had to be crushed, that the European Central Bank was prepared to breach its mandate for financial stability and deliberately cause a run on banks in a country with 50 per cent youth unemployment and a dangerously surging far right. The Greek crisis could have been easily resolved financially, well within the capacity of Germany and the other big Eurozone players. What could not be permitted under any circumstances was a successful political challenge to the rules of the game. “There can be no democratic choice against the European treaties”, European Commission President Jean-Claude Juncker insisted. Greece had to be made an example pour encourager les autres. In the course of our own referendum we have also been subject to threats over what will happen to the UK in the event of a Brexit. On occasion German Finance Minister Wolfgang Schäuble has sounded for all the world more like the head of a transnational crime syndicate than a senior public official in a democratic union of the peoples. The UK is not Greece. We could take our chances, seize the real possibility of Brexit, and work afterwards to attempt the construction of a genuine – and internationally exportable – economic alternative from the local level on up, outside of the straightjacket of the deflationary, marketised, neoliberal EU. Better that than chasing the unicorns of a reformed European Union only to wake up on June 24 to find, as did the apocryphal traveler in the Irish countryside, that you can’t get there from here. (1) Danny Nicol, The Constitutional Protection of Capitalism (Oxford: Hart Publishing, 2010), p. 1. We are indebted to Nicol’s excellent book for its analysis of the neoliberal basis of EU law. (4) Carlos Closa, “Between a Rock and a Hard Place: The Future of EU Treaty Revisions,” European Policy Analysis, March 2014. (5) Interestingly, most observers believe that, with an enlarged EU, increasing political polarisation, and the increased use of referenda, even ‘normal’ (i.e. continuing neoliberal) treaty revision will be considerably more difficult in the future. (6) See Gerassimos Moschonas, In the Name of Social Democracy – The Great Transformation: 1945 to the Present (London: Verso, 2002). (7) Of course, the re-emergence of far right politics and violence is hardly confined to EU Member States, as events from Norway to the United States demonstrate.